I would like to make a small parenthesis here, between the rustic pizza dough and chicken calzone recipe, to introduce a healthy stir fry sauce recipe. Seems fit to me ! Just like any other food lover out there, I love me a nice good stir fry on a Friday. And I do not mean take out, because I am not willing to pay for that during the weekend. I do not enjoy feeling like a stuffed animal for three days in a row, it just isn’t worth it. 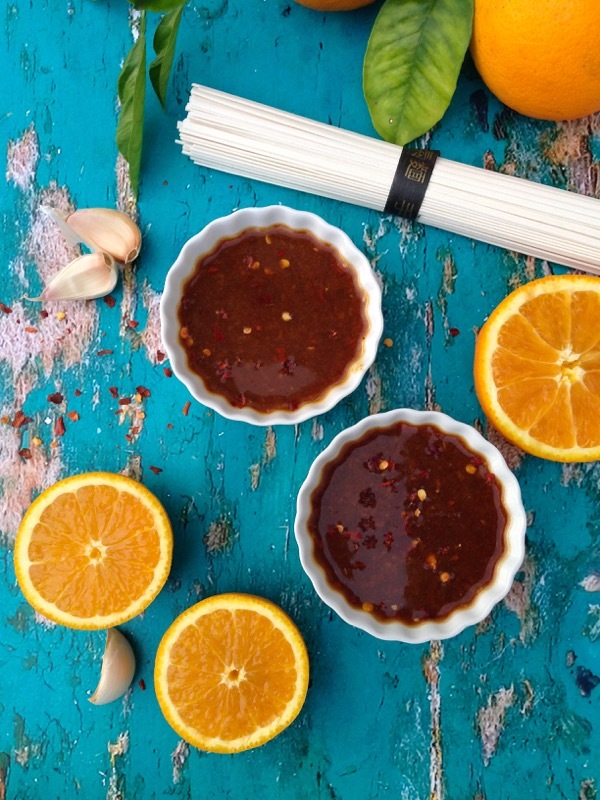 So I played around with a few mixes to come up with this easy and healthy stir fry sauce recipe. First thing I did was to swap the regular soy sauce with an organic gluten-free soy sauce. I swear that step is huge. And then I eliminated the corn starch completely, because I honestly don’t know enough about that thing to feel okay with it. I mean it comes from corn and has lots of calories, but it is also used in batteries. It weirds me out so forget it. I use coconut flour or rice flour instead, plus at the end of the day, any sauce cooked long enough will thicken, so I really don’t see the need for questionable cornstarch. 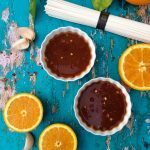 But you will need some oranges, because that freshly squeezed orange juice is the secret ingredient in this healthy stir fry sauce recipe. Once it cooks down and the sauce thickens you will be left with a wonderful aroma and that je ne sais quoi in your sauce. Pairs extremely well with a beef stir fry If you are meat eater, and even this shrimp udon stir-fry. I prefer to cook my stir fry noodles and reserve some of that pasta water to add to the final sauce and thin it out to your liking. Also, one important step is to add the stir fry sauce to the skillet after you cooked all your veggies and transferred them to a bowl. Then you add your healthy stir fry sauce recipe, and you let it reduce and deglaze all the goodness left behind from the stir fried veggies and whatever protein you decide to cook. Now you are ready to add some of the reserved pasta water to your liking. Then the noodles go in for a nice swim, pour the stir fried veggies on top and toss to coat. Serve sprinkled with some sesame seeds and you just made a better stir fry than your favorite take out place. My favorite variation of stir fry using this healthy stir fry sauce recipe, involves my favorite veggies. A yellow bell pepper for nice pop of color, crunchy snow peas, wild mushrooms and sweet scallions. A few steamed broccoli florets when I have them and some hot red chile pepper. At the end I add some chicken tenderloin cut into pieces for the Batman and everyone is happy. This healthy stir fry sauce recipe is a guilt free one, that will leave you feeling great, satisfied and not like a stuffed bear. For a more in-depth study of different stir fry dishes and Asian Noodles, hop on over to recipetineats.com where Nagi is the queen of everything stir-fry ! In a small bowl whisk all of the stir fry sauce ingredients together until incorporated. Make sure there are no lumps from the flour. Taste and adjust seasonings to your liking. Stir fry all your vegetables and protein and transfer to a bowl. Add the stir fry sauce to the pan to deglaze it together with a good splash of the pasta water (the water you cooked the noodles in). Simmer until the sauce has thickened to your desired consistency. 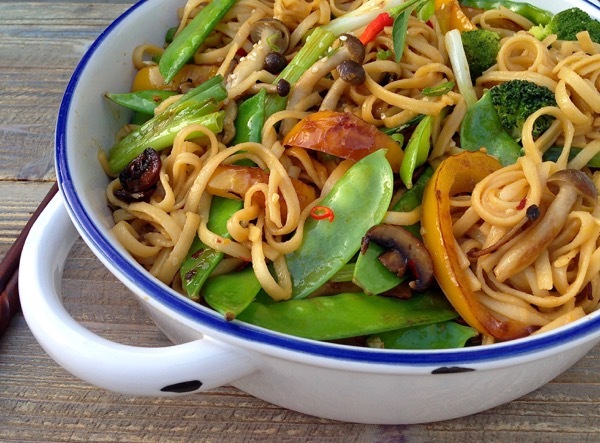 Toss with the cooked noodles to coat well and add back the stir fried veggies and protein. I too love stir-fries, and I will have to try your sauce recipe–looks delicious! Yummm! 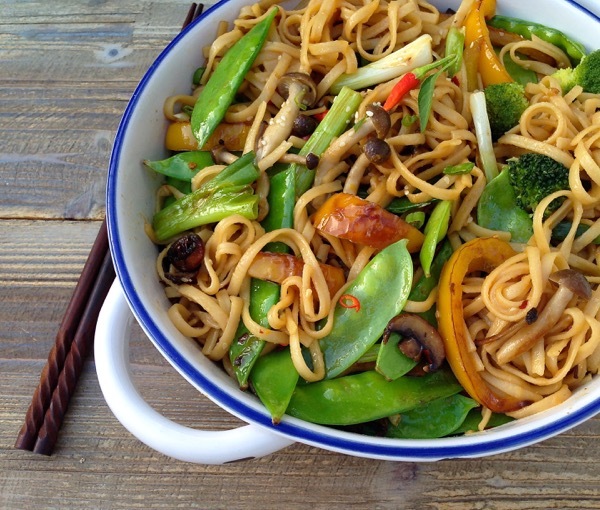 Stir fries are my favorite and this one looks amazing. I’ll take it any day of the week! Hahahaha…. you made me giggle when you said you dont enjoy feeling like a stuffed animal for 3 days. I personally love that feeling. I know, its bad! Stir fries are delicious, I dont cook them enough, mostly because you have to work for them. Thinking I will have to get my cook on tho, so I can try your amazing sauce.